If you spend a lot of time in a home workshop, you're sure to love these twelve tech tips. Available now is this quick release fitting for small angle grinders. It lets you change the cutting or grinding discs with less effort and greater speed. 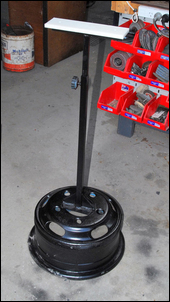 The fitting replaces the flat nut that is usually engaged by a special spanner. The new fitting has a fold-down handle that allows you to tighten the fitting by hand, then flip down the handle so that it doesn't get in the way when you’re grinding. Finally, the new nut also includes a slipping clutch that in some circumstances can protect the disc. I now wouldn't be without it! 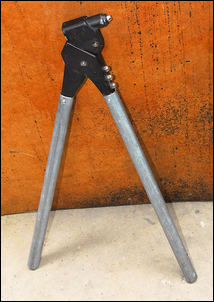 More expensive than the other tips included here is this tube bender. Australian made, the bender works extremely well - especially on square tubing. The trick in its design is in the internal formers around which the tube is wrapped. The formers are not just simple cylinders but instead have a curved, raised rib around their centre. When square tube is forced around the former, the raised rib creates a central depression on the inside of the bend. Around the outside of the bend, the outer wall is also depressed - it does this naturally. These indents allow the bend to be formed evenly. The width of the internal former matches the width of the tube, and the square tube is sandwiched between the upper plate (that is held down by a nut and lever) and the baseplate. This prevents the tube spreading during bending. The bender comes without the lever that you pull on to perform the bend - you provide it. The manual suggests a lever that’s 1 metre long; I use the longest that will freely swing within the available workshop space - about 1.5 metres. 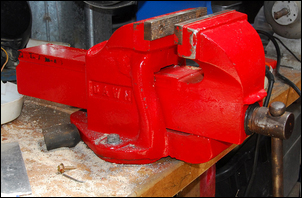 The bender mounts in a vice or can be bolted to a bench or very sturdy column. In addition to square tube, the bender can also work with round tube and flat bar. Go to http://www.ccbproducts.com/about for more on this bender. 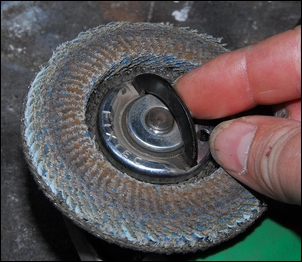 If you're packing wheel bearings or doing another job that needs lots of grease, you'll typically use either your hands or a special grease-packing tool. But what if you want to just smear grease on a flat surface or a thread? The best thing I've found for this job is to use a tongue depressor. Tongue depressors are the flat timber strips that your doctor uses to push your tongue out of the way when he or she is looking down your throat. 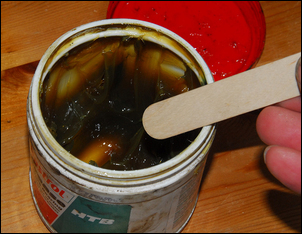 These sticks - available very cheaply from discount shops - are perfect for spreading grease. They are wide enough to carry a good hunk of grease, strong enough to be used as spreaders, and are cheap enough to be used once then thrown away. 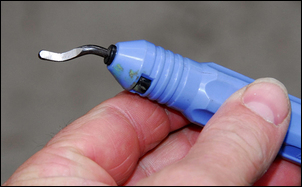 Hand-held pop rivet tools are great on small diameter, aluminium rivets. But go to larger rivet sizes and change the rivet material to stainless steel, and suddenly that hand-held tool requires herculean strength. One workaround to the problem is add longer handles to improve leverage and so reduce the effort needed. Here the plastic covers, originally moulded on the handles, have been cut off and long steel tubes have been slipped over the aluminium handles. They are held in place with a self-tapping screw on each handle. The result? Easy effort, even with stainless pop rivets. Many steel retailers have available 'seconds' - material that has some minor defects, or which has simply been left outside and gone a bit rusty. If you're using the steel for non-structural applications, using 'seconds' is fine. For example, the tube used to make these shelf brackets was sourced as 'seconds' - it had surface rust. A quick going-over with a wire brush in an angle grinder (always wear eye protection) makes it suitable for painting - or if being used inside, left as is. On the other hand (get that pun? 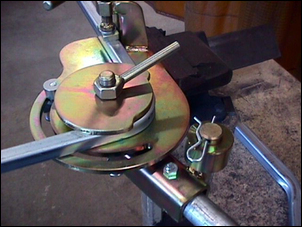 ), quick-release clamps of the sort shown here can be placed and tightened using only one hand. 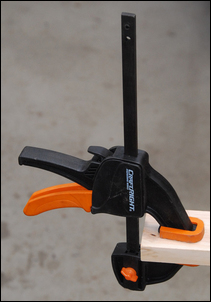 That makes them incredibly useful in a home workshop - in fact, a set of these clamps has become my most-used clamps. Here's a handheld tool that once you have one, you wonder how you did without it. It's a de-burring tool, one used to remove burrs that form on the underside of drilled holes, and inside tube cut off with a friction wheel or hacksaw. The shape of the blade is such that on thin material it will remove burrs from both sides of the material. So for example on a hole drilled through thin plate, and after using the de-burrer, there will be a slight chamfer formed around the hole on both faces. The tool can be used on steel, more gently on aluminium and - much more gently - on plastic. If you make small metal things and habitually paint them, you'll be familiar with how much work you need to put in to get a good result. What work then? Sanding, priming, undercoating, top coating - and using expensive 'suitable for metal' paints for each of the steps. However, I've found a readily available paint that gives a durable and quality result on metal. The paint is ‘Rust-o-leum 2x Ultra Cover’ and is available in lots of different colours and gloss characteritics. It is designed to go straight on bare metal. 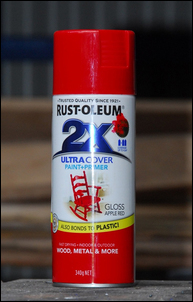 It's more expensive than a normal spray paint - but a lot cheaper than taking the primer / under coat / top coat approach. Simple, huh? But it gives the best results I've ever seen of any quick paint process on metal. A large, solid vice is a huge help in a home workshop. But brand new, they cost a lot. And second-hand they're still expensive - but less so. 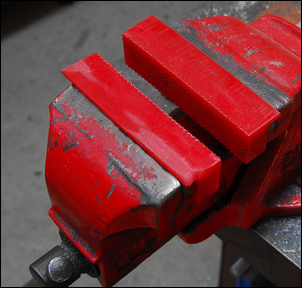 On the plus side, look for a good brand and weight - a heavy vice is likely to be a good one. When you get your new (second-hand) vice home, pull it apart, clean it, paint it (use the paint described above! ), and reassemble it with good grease. Talking about vices, if you work with material that is easily marked (like aluminium) you’ll want a set of these. They’re soft plastic jaws that magnetically attach to your vice’s standard steel jaws. The magnets keep them in place and the soft material won’t mark the work-piece you’re holding. Clip them in place when you need to! 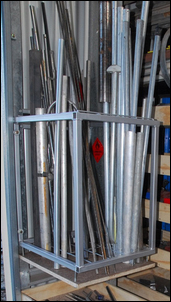 If you have lots of pipe or rod offcuts in stock, it can be difficult to work out how to store them. You want them all to be accessible - and yet still not take up much room. One approach is to make a rack like this. 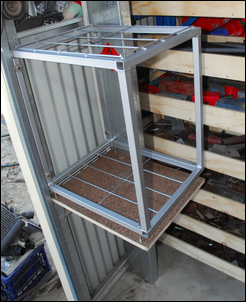 A steel frame was welded-up and then steel mesh welded top and bottom. Suspended a little below that was a strong shelf, made in this case from particle board flooring. And here it is full of steel and aluminium tube and bar stock! 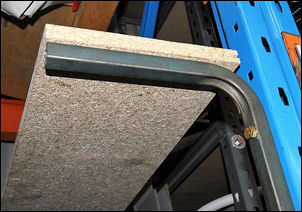 Keeping it off the floor allows you to store other materials beneath it, but still be able to reach the offcuts. The mesh keeps the different types of stock sorted. Overall, it works really well. If you use a drop-saw, panel saw or horizontal bandsaw, you’re sure to have met the problem where the material is a lot longer (or wider) than is supported by the table of the saw. This stand was made to solve that problem. It uses an old truck rim as a heavy and stable base - the rim was got for nothing at the local tip. Square tube sliding within tube and a threaded locking knob make the height adjustable, and a piece of slippery high density polyurethane was placed on top. The assembly was welded together. The material being cut (steel, aluminium or timber) slides easily on the plastic (and unlike if a roller were used, the stand doesn’t have to be orientated just right) and the stand is compact enough to be tucked away when it’s not needed. From the cheap and easy, to the more expensive and complex – there are 12 well-proven tips for your home workshop.